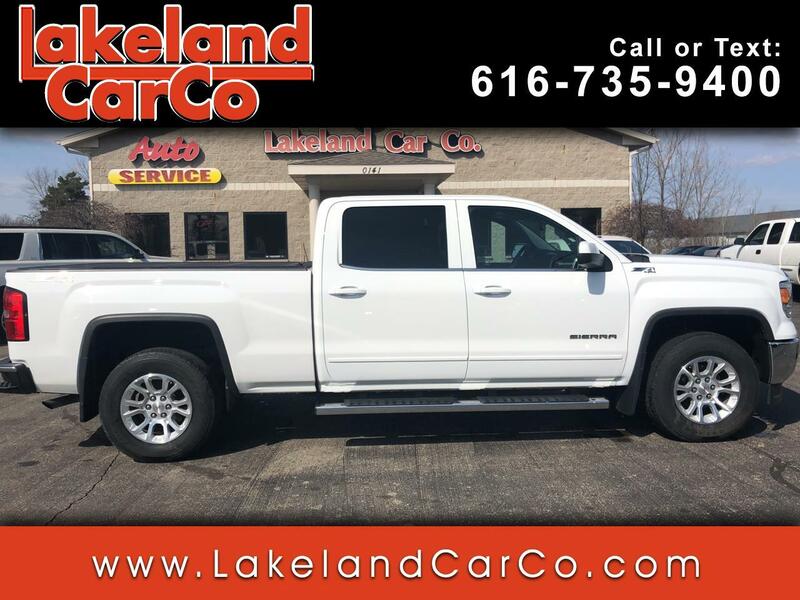 Used 2015 GMC Sierra 1500 4WD Crew Cab 147" SLE for Sale in Grand Rapids MI 49534 Lakeland Car Co. Built with your needs in mind, our 2015 GMC Sierra 1500 SLE Crew Cab 4X4 is presented in beautiful Black. This will exceed your daily needs with a proven V8 that offers 355hp while paired with a tough working 6 Speed Automatic transmission electronically controlled with overdrive and Tow/Haul mode to provide great hauling and towing capability. This Four Wheel Drive team provides you with nearly 22mpg on the highway and paired with coil over shock front suspension, offers a controlled ride that is the ultimate in comfort and handling. Our hardworking Sierra 1500 SLE has a massive grille, distinct CornerStep chrome rear bumpers, and an EZ Lift and Lower locking tailgate. Take a look inside our SLE and you'll agree that this is a solid professional grade full-size machine! Cloth seating, a leather-wrapped steering wheel with audio/cruise controls, rear vision camera, an 8-inch diagonal Color-Touch Radio with IntelliLink, and a color Driver Information Center display are just a few of the ample amenities. Sierra's cabin is engineered to provide you and your passengers with a quiet, comfortable experience! The well-known Chevrolet safety features are in place, including StabiliTrak with Traction Control, Hill Start Assist, and plenty of airbags. This no-nonsense truck will make sure it fulfills your needs for work and play. Get the job done right, with the security, performance, and comfort that only come from the GMC Sierra 1500. Don't delay... Print this page and call us Now... We Know You Will Enjoy Your Test Drive Towards Ownership!